Let us know if it's a go-ahead. Fine by me. Go ahead. 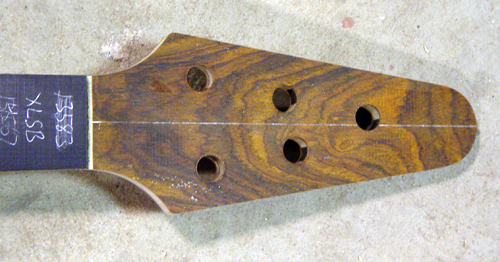 I gave Chip the go-ahead, so pictures with actual wood will start appearing shortly. Wow, once things start, they move fast! 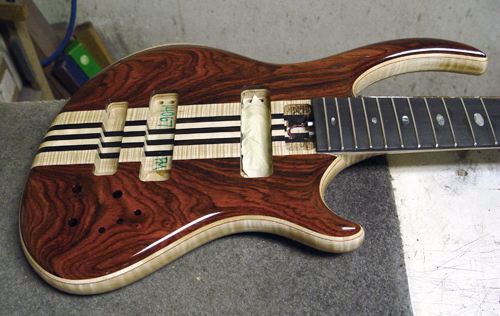 I like the choice of top, back, and headstock woods. Edit: I just opened the pictures in Photoshop. 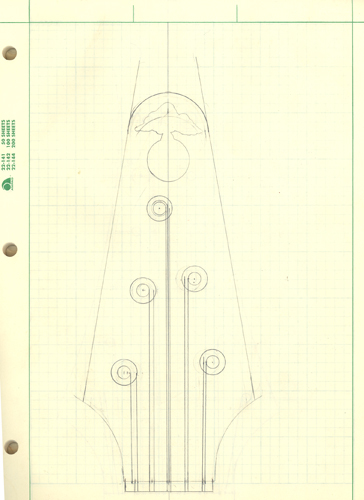 Looks like the twelfth fret has a standard oval. 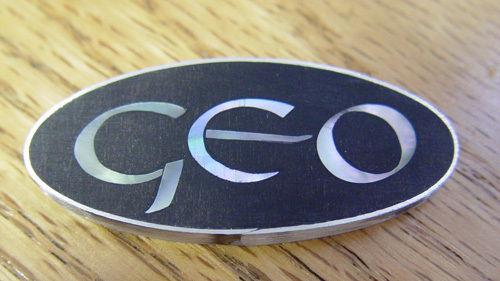 What about the custom inlay? Bright lights in this work area mess with the color some! Thanks for the update. 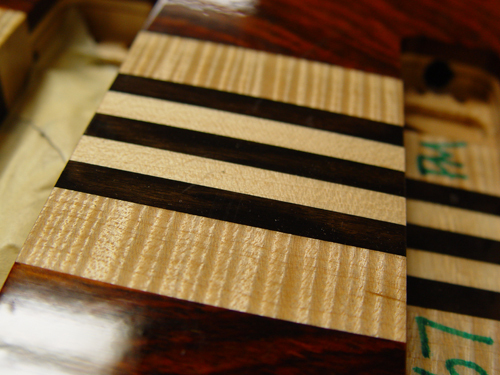 I'm sure the colors will darken and the grain will appear when the finish hits. And today the hardware will get mounted and prepared for chrome plating. 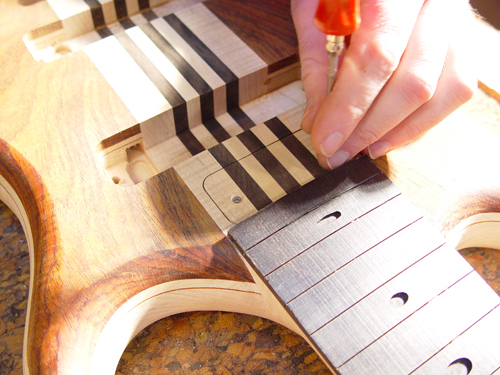 The Flame Maple in the neck looks nice! 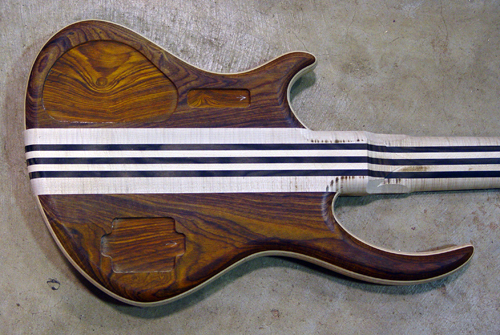 And it looks like a Flame Maple body as well. Yes, Dave; I was hoping for a Tribute look. And once the finish is on, there it is :-). Mica, thanks for the pics update. One thing occurred to me.... Shouldn't there be a fourth large hole for the LED dimmer? No worries, George, the hole will be there. James drills that out when he's installing the electronics. The holes for the main electronics are drilled according to their pattern (Signature, Europa, etc), then later we drill any extra holes that are needed. 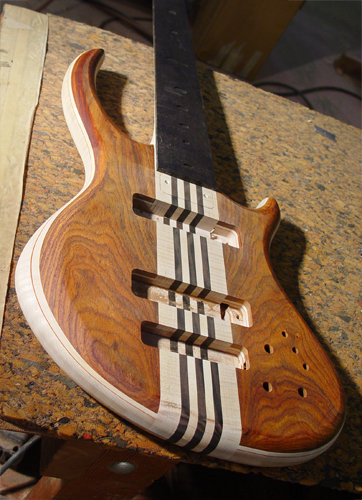 The bass is done now, just needs final inspection, so it should ship in the next couple of days. Nice rendering of the uncial hand. I presume thanks goes to James for that! I called Paul Schein at Washington Music, so he's expecting it. That means that one day in the next few weeks, I'll blow off work (which isn't all that tough to do, given that I'm a college prof :-)! ), drive from Baltimore to Wheaton and back, and bring home a new household member. Life is good!